I absolutely adored Seasons by Anne Crausaz. The unique digital illustrations alone are worth their weight in gold. 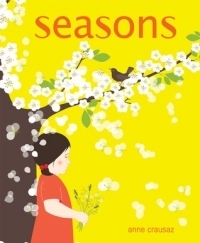 In Seasons, Crausaz takes us on a trip through the changing seasons, each page evoking feelings of longing and nostalgia. She explores the little things we so often take for granted: the tickle of a ladybug on our finger; the light of fireflies; the smell of basil, verbena and mint; the rumbling of summer storms; gritty sand in your mouth; the crackling of Autumn leaves; the quiet fog of winter; and more. The simple but elegant illustrations lend a kind of quirkiness and beauty that will make this book a favorite for kids (and adults) everywhere. Quiet and understated, it's one of those books you want to hug tightly to your chest after you've turned the last page. I'll be sharing this book with every child I know, hoping to pass along my love of nature, home-grown produce, and the outdoors. And I'll be looking for more books from Crausaz to add to my picture book collection. Very well done. 5 stars!